This headline from the Davenport Daily Leader, December 9, 1894 references two sensational murder cases. 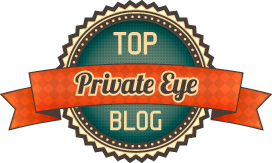 The second case, the murder of Catherine Ging in Minneapolis, has already been covered in detail in this post: The Minneapolis Svengali. 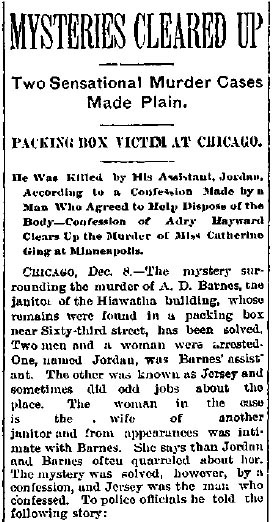 Here is the "Packing Box Victim at Chicago:"
Two Sensational Murder Cases Made Plain. Packing Box Victim at Chicago. He was Killed by His Assistant, Jordan, According to a Confession Made by a Man Who Agreed to Help Dispose of the Body—Confession of Adry Hayward Clears Up the Murder of Miss Catherine Ging at Minneapolis. “At 4:30 Thursday afternoon at Muldoon’s saloon, a messenger came to me saying that Jordan wanted me to help him that night. I went to the Hiawatha at that and met Jordan who said: ‘Come back at 8:30 and I will have a job for you.’ I went there at 8:30 and he told me he had a box to hide. “’It is the body of a man,’ was the reply. 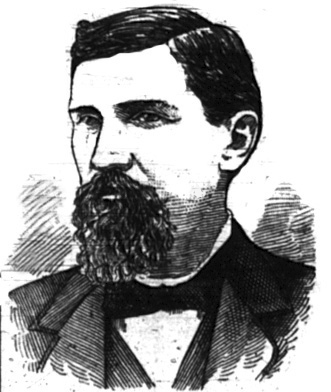 “I looked in and saw Barnes’ body I was in my shirt sleeves and got blood on my shirt. Jordan and I carried the box to the back yard and left it there. The confession was received after Mrs. Dore, a woman living in the building had identified Jordan and Jersey as the men she had seen carrying out the box. Jordan is weakening and is expected soon to break down and tell all about how he killed Barnes.